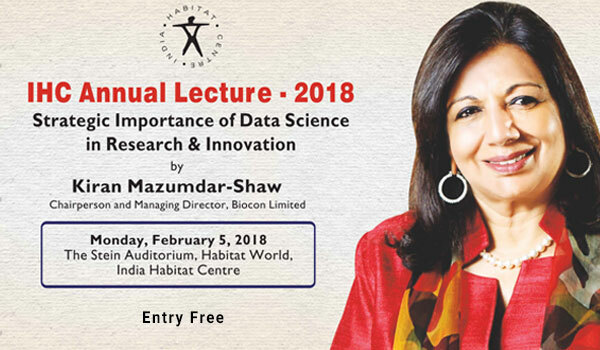 The India Habitat Centre Annual Lecture will be delivered this year by Ms. Kiran Mazumdar-Shaw. The Theme of the Lecture is "Strategic Importance of Data Science in Research & Innovation". This will be at the Stein Auditorium at 7 pm on Monday the 5th of February. The lecture is open to all. The lecture will be followed by a question and answer session. Abstract: We stand at the dawn of the Data Age, where data will be the lifeblood of our rapidly expanding digital existence and the new raw material of business. This unimaginably vast amount of digital information can enable humanity to do many of the things that were previously considered impossible. Data Science is helping us find relationships between distinct kinds of information, thus generating new insights and creating new knowledge. By enabling new ways of thinking and amplifying human innovation, Data Science can unleash breakthrough innovation and be the most potent instrument for transformative social change the world has ever seen.